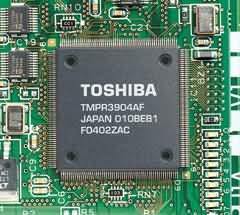 Toshiba has announced it will sell a slice of its smartphone memory chip unit. The company needs to raise funds after revealing a heavy one-off loss at its US nuclear power business. Toshiba will unveil the size of the write-down next month, but some estimate it could be around $6 billion. It is widely reported that 20% of the chip business will be sold off, and Toshiba is expected to confirm this later. Toshiba’s chip business is the second biggest in the world after Samsung’s, and has been valued at between $9 billion and $13 billion. The company says it hopes to have struck a deal by the end of March. Reports suggest Canon, Western Digital and the Development Bank of Japan could be potential buyers, though analysts expect Toshiba may be forced to accept a cut-price offer given its financial woes are well-publicized. Shares in Toshiba have fallen more than 45% since late December, when it revealed the problems in its nuclear arm, linked to a deal done by US subsidiary, Westinghouse Electric. Westinghouse bought a nuclear construction and services business from Chicago Bridge & Iron (CB&I) in 2015. But assets that it took on are likely to be worth less than initially thought, and there is also a dispute about payments that are due. Toshiba has also reported “inefficiencies” in the labor force at CB&I, along with other factors driving up costs. The damage to its finances threatens to undo efforts to recover from 2015 revelations that profits had been overstated for seven years. The accounting scandal led to the resignation of the company’s chief executive. Since then, Toshiba has been trying to slim down the business, including selling its profitable medical devices operation to Canon in 2016. Eight of South Korea’s biggest businesses, including Samsung and Hyundai, are being questioned by parliament in a rare TV hearing as part of a huge corruption inquiry. The companies admitted giving millions of dollars to funds linked to President Park Geun-hye, but denied seeking favors. Samsung admitted to giving the daughter of Park Geun-hye’s friend an expensive horse. Parliament is due to vote on December 9 on the president’s impeachment over her involvement in the scandal. Massive protests have been held in recent weeks demanding the president’s resignation. The executives are being questioned by a cross-party committee of lawmakers. The panel has no power to punish but its chairman has said the hearing is a place for apology. The conglomerates all gave large donations to non-profit foundations operated by Choi Soon-sil, a close confidante of Park Geun-hye. 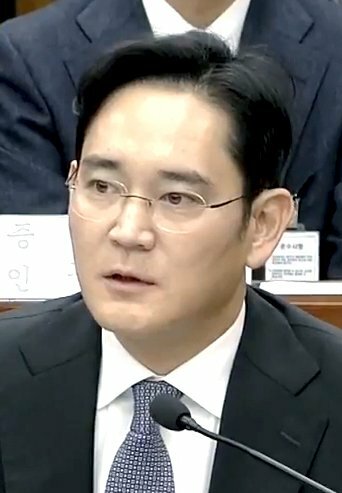 Lawmakers spent the most time grilling Samsung’s Lee Kun-hee. Samsung has been accused of giving donations in exchange for support of a controversial merger that effectively strengthened his position in the company. 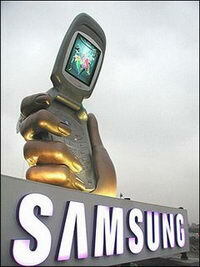 Samsung gave a total of 20.4 billion won ($17.46 million) to the two foundations. 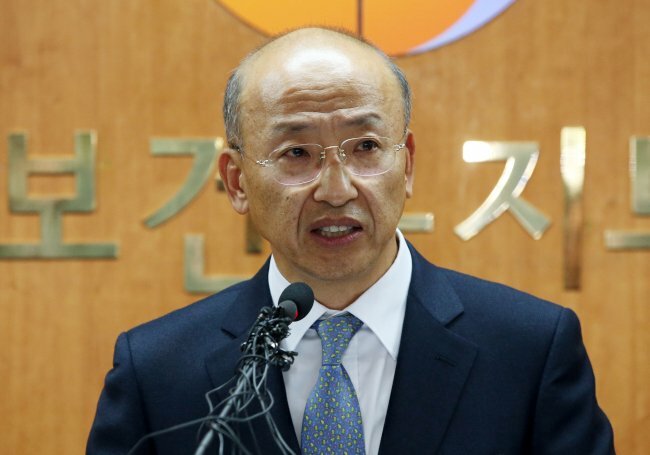 Like the other leaders, Lee Kun-hee denied the allegations, saying Samsung “never provided support or gave donations in return for something”. However, he admitted that his company provided a one billion won ($855,000) horse to Choi Soon-sil’s daughter, a professional equestrian, and said he regretted it. Lee Kun-hee apologized for Samsung’s involvement in the scandal and said his company would “take all responsibility” if there was any. South Korea’s family-owned conglomerates, known as chaebols, have increasingly been perceived as a symbol of the out-of-touch elite, and have become a target of public fury in recent protests calling for Park Geun-hye’s resignation. The president has apologized multiple times to the public for allowing Choi Soon-sil inappropriate access to government decisions but has stopped short of resigning. Last week Parke Geun-hye said she would leave it to parliament to decide her fate, and on December 6 she was quoted by her party’s leader as saying she would accept the outcome of December 9 impeachment vote. Samsung has reportedly stopped production of the Galaxy Note 7 smartphone amid claims that replacement devices still have critical battery issues. Reuters and Yonhap cited unnamed officials claiming Samsung had temporarily halted its Galaxy Note 7 production lines. The move came as two the AT&T and T-Mobile networks stopped replacing or selling the Note 7. On October 3, Samsung said it would also stagger shipments of the Note 7 to conduct in-depth inspections. The South Korean tech giant issued a recall of the Galaxy Note 7 in September and assured customers last month that the fixed devices were safe. However, there have now been several reports of replacement phones starting to emit smoke. It advised customers to exchange them for other devices. In an update on October 9, Samsung said it understood the concerns of carriers and consumers about the newly released replacement Note 7 devices. Samsung’s shares fell 1.5% in Asian trade. Samsung Galaxy Note 7 users traveling by plane have been warned by the Federal Aviation Administration (FAA) not to switch on or charge their phones when on board the plane. The FAA also advised against packing the phones into any checked-in luggage. Last week, Samsung recalled the Galaxy Note 7 smartphone after reports emerged of the device exploding during or after charging. Qantas and Virgin Australia have also told customers not to charge or use the smartphone during flights. The Galaxy Note 7 was launched last month and has been otherwise generally well-received by consumers and critics. Some 2.5 million phones have been shipped globally. The US trade group Airlines for America said it was “closely monitoring” the Galaxy Note 7 issue and that carriers in the US would make their own ruling over the use of the phone on board. Samsung Electronics has decided to recall its flagship Galaxy Note 7 smartphone saying that battery problems were behind phones catching fire. According to US and South Korea reports, the phone “exploded” during or after charging. Samsung said customers who already bought Galaxy Note 7 will be able to swap it for a new one. The recall comes just one week ahead of Apple’s expected presentation of a new iPhone model. The South Korean company said it would take about two weeks to prepare replacement devices. According to Samsung, the Galaxy Note 7 has been launched in 10 countries so far but with different companies supplying the batteries. Over the past days, several users had reported their phones caught fire or exploded while charging, and Samsung said it had confirmed 35 such cases. The Galaxy Note 7 was only launched on August 19 and has since them been generally well-received by critics and consumers. The model is the latest of Samsungs’ series of so called phablets – smartphones with very large screens and, in the case of Samsung, featuring a stylus. Sony has revealed a new edition of its virtual reality helmet Morpheus, which it says it plans to put on sale in 2016. The new edition of Project Morpheus now features an OLED display, rather than an LCD one, letting it show more vibrant colors. That brings it in line with Facebook’s rival Oculus Rift. The new virtual reality (VR) helmet is also capable of showing graphics at 120 frames per second (fps). That beats the figure given by HTC for its recently unveiled Vive VR headset. HTC said on March 1 that its helmet provided a refresh rate of 90fps. 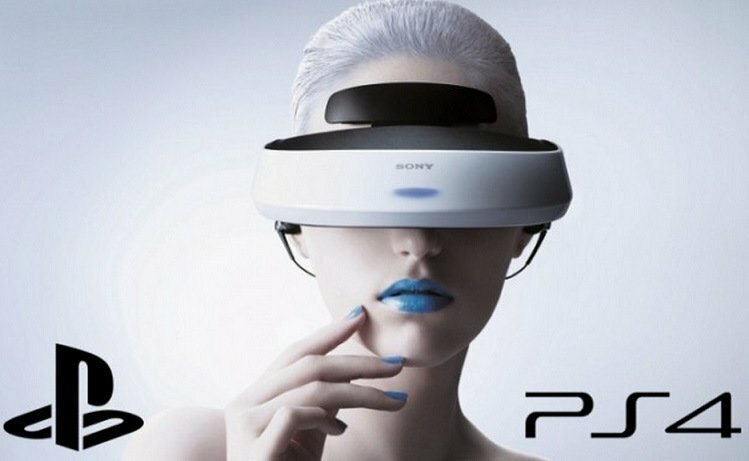 Sony’s announcement is a surprise, because until now, the PlayStation console – which Morpheus depends on to play games – had not been thought to be able to render games at this rate. However, speaking at the Game Developers Conference (GDC) in San Francisco, PlayStation executive Shuhei Yoshida revealed that a software update would allow the machine to create an “in-between frame” to double its current maximum of 60fps. “Higher frame rates are definitely important because they are going to translate into higher responsiveness of the gaming environment,” explained Brian Blau, an analyst at the Gartner tech consultancy who previously worked in the virtual reality industry. The screen resolution remains at 1080p high definition, providing 960 pixels by 1080 pixels per eye. Shushei Yoshida said the current version was “near final”, suggesting there were further improvements to be made before it goes on sale, which is scheduled to happen within the first six months of 2016. He added that more details would be unveiled at the E3 video games expo in June. The release date is later than that of HTC’s Vive headset – a collaboration with video games publisher Valve – that is set to launch before the end of this year. HTC’s kit is expected to be designed for games sold via Steam’s PC-focused Steam online marketplace, meaning it may not directly compete with Sony’s machine. PCs can generate higher quality moving images than the PS4 if fitted with special graphics cards. Valve also released more details about how its VR system would work. It said a tracking-system called Lighthouse would let users explore a virtual space and the objects within it from different angles by moving about in real life. “In order to have a high quality VR experience, you need high-resolution, high-speed tracking,” said Valve’s Alan Yates in a statement released by HTC. HTC said it would allow manufacturers to build Lighthouse into their products without charging them a fee. It also announced the Source 2 games engine – software used to create video games with 3D graphics – which it is making available to third-party developers. The original version, which is 10 years old, was used to make games including Half-life 2, Portal and Titanfall. Valve may provide more details about its VR platform later this week when selected GDC attendees will be among the first to try out the HTC Vive. Oculus has yet to set a release date for its PC-connected virtual reality helmet. However, Samsung already sells Oculus-branded VR kit that uses its smartphones as screens. “I think 2015 and 2016 are going to be seminal years for VR,” said Sony’s Brian Blau. “There’s a lot of products coming to market, which is going to mean consumers get to experience it in a way they haven’t been able to do before: at home and in high quality. “Here at GDC, there are a lot of developers who are interested in VR. 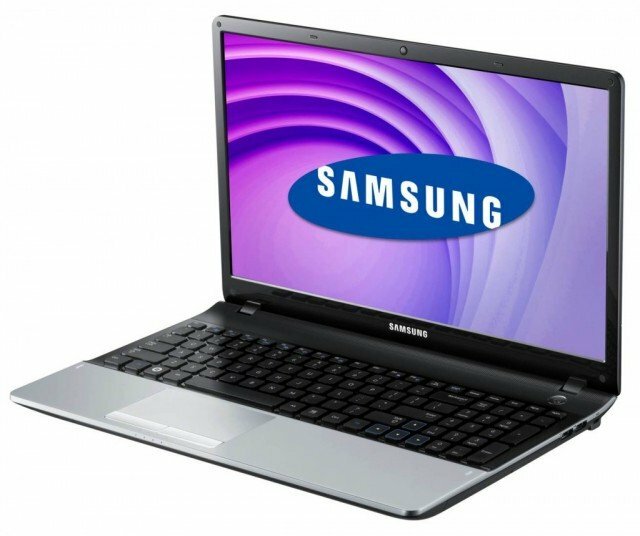 Samsung is ending its laptop sales in Europe, the company has announced. The move includes its Chromebook model, which had previously been one of the category’s best-sellers. The South Korean company’s decision follows Sony’s announcement earlier this year that it was selling its Vaio division and pulling out of PC sales altogether. However, other companies have recently reported growth in the sector. Samsung signaled it might consider similar action in other parts of the globe. “We quickly adapt to market needs and demands,” said the company in a statement. “In Europe, we will be discontinuing sales of laptops including Chromebooks for now. “This is specific to the region – and is not necessarily reflective of conditions in other markets. According to analysts, portable PC sales will grow by 5.6% this year in mature markets, partly offsetting a decline in 2013. However, Samsung does not feature in its list of the top five PC sellers, and it appears that rivals have accounted for what growth there is. Lenovo recently reported a 17% rise in revenue from notebook sales in its April-to-June quarter compared to the same period the previous year. It claimed that made it the most popular laptop brand in 15 European, Middle Eastern and African nations. Apple also posted a 13% year-on-year rise in Mac sales over the same three months, driven in large part by demand for the MacBook Air. Samsung’s smartphones have also come under pressure in recent months. Surveys indicate sales of Samsung’s phones have been overtaken in India and China by local companies Micromax and Xiaomi. That resulted in the Samsung Electronics division posting a 20% year-on-year drop in its net profit in June and dozens of executives voluntarily handing back part of their bonuses. However, in recent weeks Samsung’s soon-to-be-released Galaxy Note 4 large-screened smartphone and add-on virtual reality headset have both attracted warm reviews. Samsung has unveiled its virtual reality headset Gear VR and Galaxy Note Edge, a smartphone whose screen bends around one of its sides. The new kit was revealed at this year’s IFA tech show in Berlin. In addition to the Gear VR and Galaxy Note Edge, Samsung also showed off the fourth standard version of its large-screened Note smartphone, which introduces an ultraviolet light sensor. The announcements come at a time when Samsung Electronics is perceived to be on its back foot. In July the division reported a 20% year-on-year drop in its net profit and dozens of executives voluntarily agreed to return part of their bonuses. Samsung’s smartphone market share fell from 32.2% in the April-to-June quarter of 2013 to 24.9% in the same period this year, according to research firm IDC, despite the fact it has one of the biggest ranges of handsets. By contrast, its Android rivals Lenovo, Huawei, Xiaomi and Motorola all made gains. At IFA, DJ Lee, Samsung Electronic’s marketing chief, said his company was “focused on accelerating the speed of innovation” and promised to “never slow down”. The virtual reality headset is the result of an alliance with Facebook-owned Oculus and acts as an add-on for the Galaxy Note 4. It uses the phone’s 5.7in screen and speakers, and adds a focal adjustment lens – allowing it to adjust for near and farsighted eyes – and a variety of sensors to track head movements. Samsung said the machine would offer a 96-degree field of view, giving an experience similar to looking at a giant 175in screen from 6.5ft away. The Gear VR will be sold with a microSD card containing a small collection of 360-degree videos and virtual reality games. Samsung said the point of wrapping the screen of the Galaxy Note Edge around its side was to offer a new way to access frequently used apps and alerts, which would be useful at times when the rest of the screen was obscured by a protective cover. It acts as a kind of scrollable dock or toolbar that can be controlled with a swipe of the thumb. One expert suggested the functions offered by the Gear VR and Galaxy Note Edge might take a while to reach their full potential. Samsung appears to recognize that of its new devices, the Galaxy Note 4 is likely to be the bestseller, calling it the “hero of the day”. 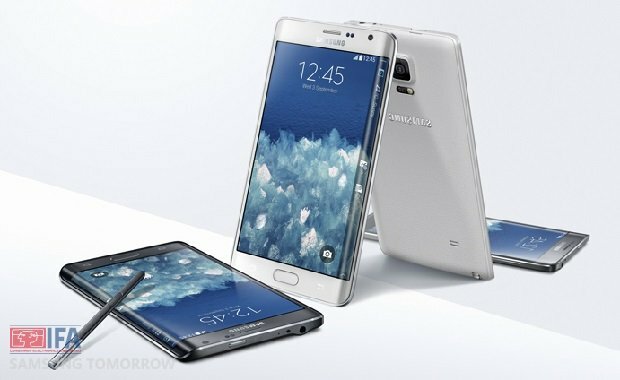 Galaxy Note Edge is the same size as its predecessor, but now features a “quad HD” screen with 550 pixels per inch, meaning it should in theory present more detail than most of its rivals. Boosting screen resolution takes a toll on battery life, but the company was keen to promote that it had included “fast charging” technology. 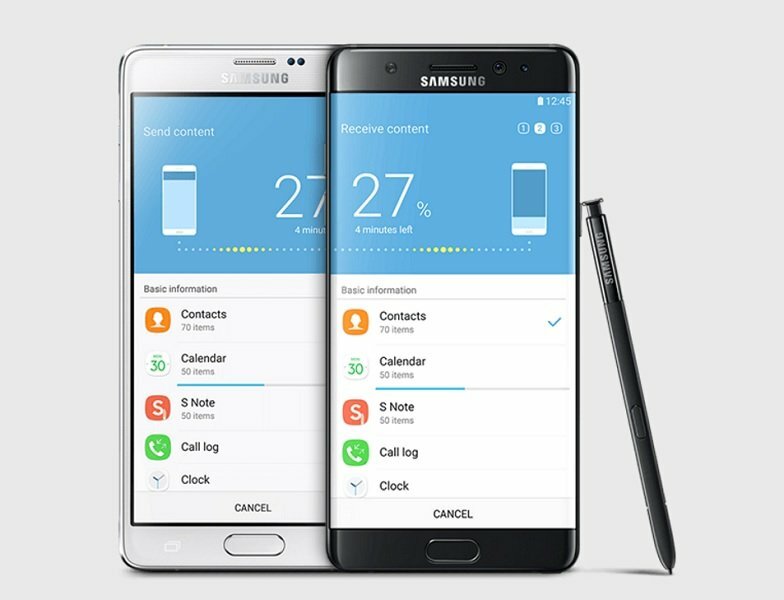 It said the Note 4 would take about 30 minutes to bring its battery up to a 50% charge, versus a 55 minute wait for the Note 3. The most unusual feature, however, is the inclusion of what Samsung says is the “world’s first UV sensor in a mobile device”. The component provides users with a built-in way to track their exposure to sunlight if they keep the device outside of their pocket or bag. However, Netatmo’s June – a bracelet that wirelessly transmits UV levels to connected smartphones – may offer a more practical solution for consumers wanting this feature. A federal court in California has ordered Samsung to pay $119.6 million to Apple for infringing two of its patents. The jury delivered its verdict in a federal court in San Jose on Friday in the latest lawsuit involving Samsung and Apple. Apple had sought $2 billion at the trial, accusing Samsung of violating patents on smartphone features. Apple had sought $2.2 billion after accusing Samsung of infringing five of its patents covering functions such as the “slide to unlock” from its devices. Samsung denied any wrongdoing and sought $6 million after arguing Apple had infringed two of its smartphone patents related to camera use and video transmission. This verdict marks the latest legal battle over intellectual property between the world’s top two smartphone makers. Apple and Samsung have been fighting patent battles for years and across many countries. 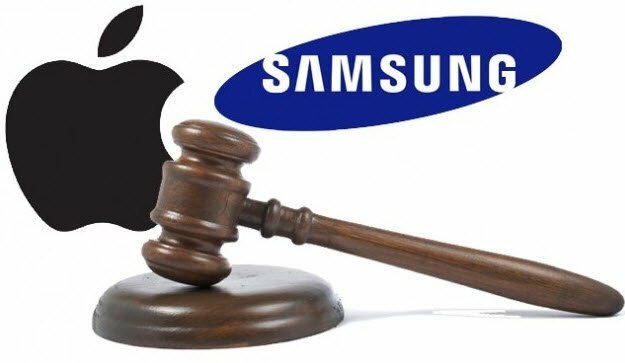 Two years ago, a separate jury ordered Samsung to pay Apple $930 million after finding it had used Apple technology. That verdict is still being challenged by Samsung. Apple and Samsung have both issued alerts about faults on iPhone5 and Galaxy S5 handsets. Apple has begun a replacement program for some of its iPhone 5 handsets that have a faulty sleep/wake button. Apple’s replacement program begins in the US on April 28 and rolls out worldwide on May 2. Customers with affected handsets can either post their device to an Apple repair centre or drop it off in person. Samsung has been criticized by the White House for promoting a selfie taken by Boston Red Sox player David Ortiz with President Barack Obama. The picture was taken by David Ortiz on his phone this week and was re-tweeted by Samsung to millions of the phone maker’s 5.2 million followers. White House spokesman Jay Carney said the president’s image should not be used for commercial gain. Samsung representatives have not so far commented on the issue. Jay Carney said that White House lawyers were being consulted over the issue. Jay Carney declined to discuss how the White House had objected. 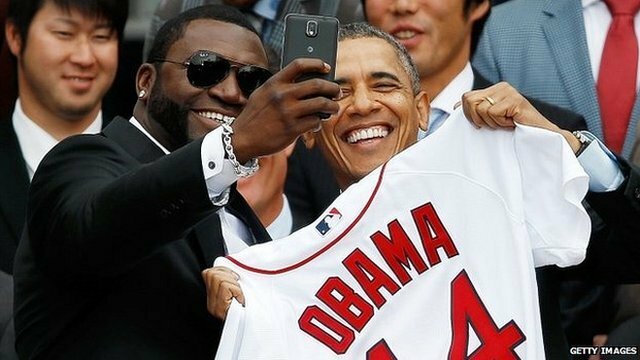 David Ortiz gave Barack Obama a special Red Sox jersey with the president’s name on it at the function on Tuesday and then persuaded him to pose for the smartphone selfie. “I gave him the jersey, and the photographers were going to take their pictures and I thought, really at the last second, maybe I should snap a shot with my phone while I have the chance,” David Ortiz told the Boston Globe. David Ortiz denied that Samsung paid him any more money for taking the photo. 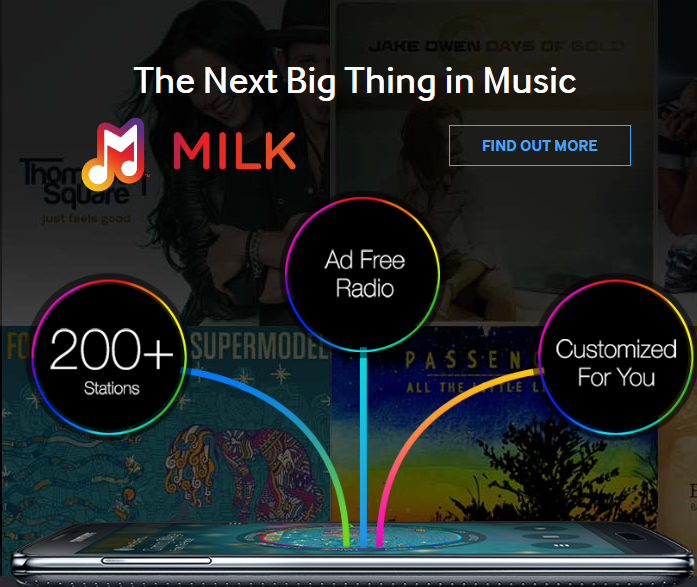 Samsung has launched its free music streaming service Milk Music. Milk Music, currently only available on its Galaxy range of smartphones in the US, includes over 200 radio stations and 13 million songs. However, Samsung said it was still confident of attracting users. Samsung said Milk Music would be free to download and have no adverts for a “limited time”. 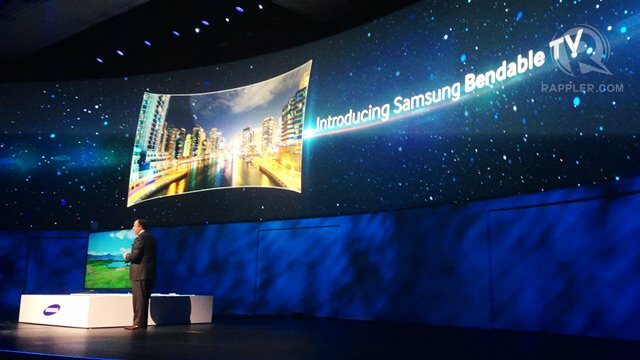 Samsung has unveiled the Bendable TV, an 85 in (216 cm) prototype that allows the curvature of its screen to be adjusted by remote control. LG has also announced a smaller 77 in (196 cm) flexible TV of its own that is based on OLED (organic light-emitting diode) technology. The two companies are showing off new giant-sized 105 in (267 cm) concave-screened versions in the extra-wide 21:9 aspect ratio. Michael Bay later wrote a blog giving his take on the mishap. 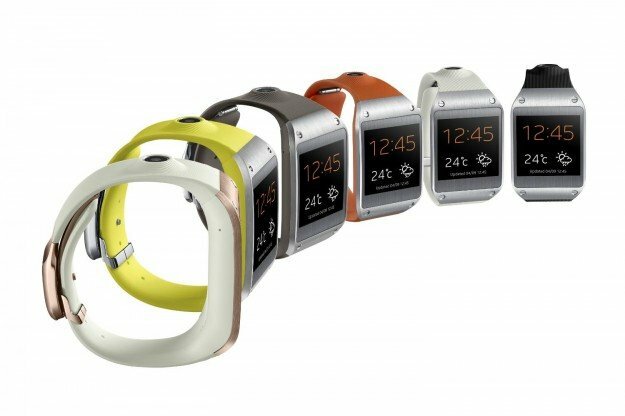 Samsung has unveiled Galaxy Gear, a smartwatch with color screen that can show alerts and can be used for voice calls and run apps. The Galaxy Gear had been highly anticipated since the firm is currently the world’s bestselling smartphone maker and has beaten Microsoft, Apple and Google to unveil such a device. Samsung called it a “fashion icon”. However, analysts warned that a decision to limit the watch to working as an accessory to other Galaxy Android devices might limit its appeal. Samsung has previously said growth in the sales of its handsets was slowing, so investors are eager to see if it can find another successful product. The company unveiled the watch – which will go on sale from September 25 – at the IFA consumer tech show in Berlin. “The introduction of the Galaxy smartwatch comes as no surprise to the industry, which has been expecting Samsung to beat the likes of Apple – as well as watch makers and other consumer electronics companies – to market,” said Chris Green, principal technology analyst at the consultancy Davies Murphy Group. The South Korean firm’s approach contrasts with that of Sony whose forthcoming Smartwatch 2 can be paired with any device running Android 4.0 or higher. But one industry watcher said Samsung’s decision should not be a surprise. “Samsung is trying to build its own ecosystem, so why do something that brings value to somebody else?” asked Carolina Milanesi, an analyst at tech advisors Gartner. The Galaxy watch will cost about $300 making it more expensive than Sony’s device which costs $185. Start-up Omate is planning to release a watch in October that matches Samsung’s in price, but its device is set to feature a 3G chip meaning it can make calls and work as a standalone device. Qualcomm has also unveiled Toq, a watch using the firm’s Mirasol color display technology which should mean better battery life than its rivals. It also links up to a range of Android smartphones, will go on sale next month at a suggested retail price of $300. The Galaxy Gear features a 1.6 in (4cm) LED display, a 1.9 megapixel camera, a speaker and microphone, has four gigabytes of internal storage and a non-removable battery. Samsung said the watch could be used as a way to make voice calls without having to take the phone it was linked to out of the owner’s bag or pocket. Galaxy Gear comes preloaded with 10 different clock options and there will be about 70 apps available at launch including Evernote’s note-taking software, auction service eBay, the social network Path and several fitness programs. Public prosecutors in Brazil have begun legal action against Samsung, alleging that it has been violating labor laws at its factory in the Amazon region. Prosecutors accuse Samsung of making its employees work long, tiring shifts without sufficient breaks. The prosecutors’ office in the city of Manaus said one worker reported packing nearly 3,000 phones a day. Samsung plant, located at the Manaus Free Trade zone, employs some 6,000 people. 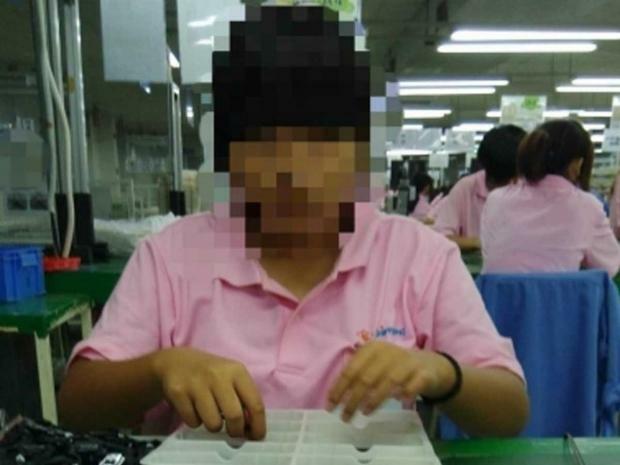 A worker at the Amazonas state factory has only 32 seconds to fully assemble a mobile phone and 65 seconds to put together a television set, prosecutors allege. In evidence given to prosecutors, employees say shifts can last 15 hours and some say they suffer from back ache and cramps as they are forced to stand for up to 10 hours a day. 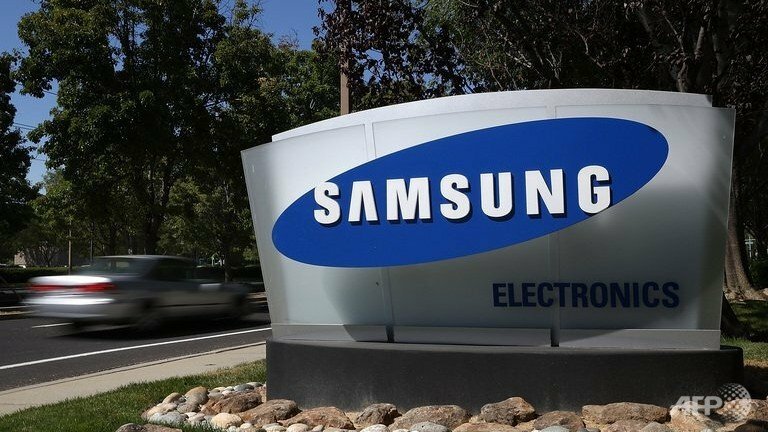 The prosecutors’ office is claiming more than 250 million reais ($108 million) in damages from Samsung for serious violations of labor legislation. The legal suit was filed on Friday, but has only now been made public. 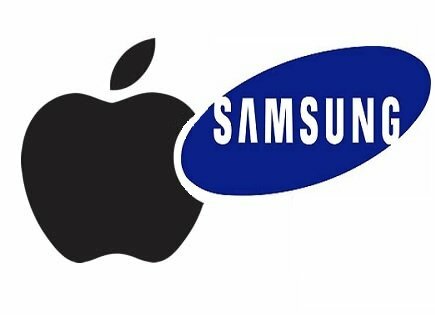 Giant tech Apple has won a key patent case against rival Samsung at the US International Trade Commission (US ITC). The commission has ordered that Samsung devices affected by the ruling are banned from the US. But that ban is on hold while President Barack Obama reviews the decision. The first is the so-called “Steve Jobs patent”, named after the company’s founder, which involves touch-screen technology. 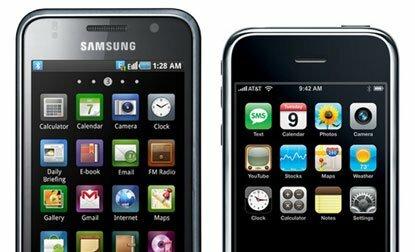 In Washington on Friday, a federal appeals judge heard testimony in a separate patent case between the two companies relating to a decision last year, in which Samsung was found to owe Apple $1 billion for infringing on patents. That penalty was later struck to $450 million, but Apple appealed against the ruling. A verdict in that case has not yet been issued. Separately, last weekend Barack Obama issued the first presidential veto in 26 years relating to a US ITC decision. “In a way. the noose is tightening. Apple step by step actually is gaining leverage against Samsung,” says Florian Mueller. Samsung Galaxy S4 has been launched last night revealing a last generation smart phone complete with a gallery of never-before-seen technology. In a much-hyped public event, Samsung introduced the Galaxy S4 with an array of new features, including a few triggered with simply a wave of the hand. The event at New York’s Radio City Music Hall – which featured a live orchestra, bubbly master of ceremonies and even a tap dance number – was streamed on Samsung’s YouTube channel. 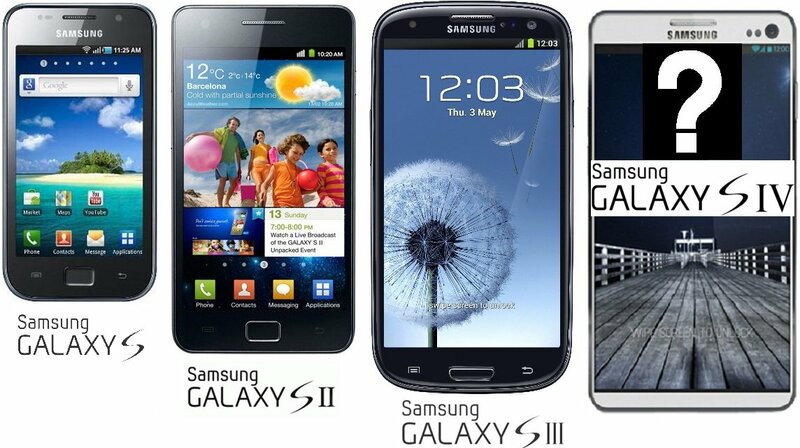 Samsung Galaxy S4, which crams a 5-inch 1080p screen into body slightly smaller than the S III’s, will go sale globally in the April to June period. Skinny but durable, the S4 is 69 mm wide, and 7.9 mm thick. It weighs just 130 grams, and is encased in polycarbonate. The newest features involve different options for navigation. If the phone senses someone is looking at the screen, the user can tilt it forward or backwards to scroll up and down a Web page. That feature falls slightly short of what some consumers may have expected after the New York Times reported that the phone would be able to scroll automatically by tracking readers’ eyes. But what it can do is sense when it has someone’s attention. When a video is playing the stream will automatically pause if the person looks away from the device and it will restart when the eyes come back to the screen. Texting while driving will be a thing of the past, as the smart phone’s voice recognition feature has the capability to dictate, reply, forward and save messages using only verbal commands. The same voice recognition can be seen in the translator feature, which can understand nine languages. Samsung has also made efforts to combat the issue of messy fingerprints, with a screen that now senses fingers hovering just above the screen, and applications that react. The Mail application shows the first few lines of an email when a finger hovers above it in the list, and the Gallery application shows an expanded thumbnail. Users can control some other applications by making gestures in the air above the phone. In the browser, you can command the screen to scroll up by swiping from top to bottom a few inches from the phone. The Camera application can now use both the front and rear cameras simultaneously, and can insert a picture of the photographer even as he or she is capturing the scene in front of them. Samsung Galaxy S4 also has an erase feature, which allows the phone to take several pictures of a subject, then create a composite of the images to remove an unwanted photobomber. In the US, Galaxy S4 will be sold by all four national carriers – Verizon Wireless, AT&T, Sprint Nextel and T-Mobile USA – as well as by smaller ones US Cellular and Cricket. Samsung did not say what the phone will cost, but it can be expected to start at $200 with a two-year contract in the US. JK Shin, the executive in charge of Samsung’s mobile communications division, promised the money would be well spent for a “life companion” that will “improve the way most people live every day”. 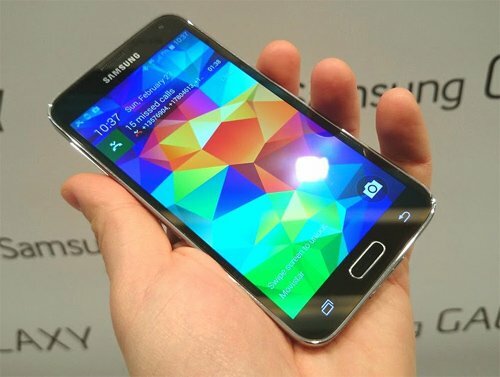 Slightly thinner than its predecessor, the Galaxy S4 will go on sale next month. The skinny but durable handset includes such special features as voice-recognition text messaging, translator software that can recognize 9 languages and an incredible touchscreen technology that toggles some features just by waving your finger. It uses apps like Samsung’s WatchOn to bring on-demand video straight to the phone. The cameras on each side of Galaxy S4 can be used in sync with each other, planting the photographer inside the photo he or she is taking. It also has an erase feature. Samsung is set to launch Galaxy S4, a device included its flagship premium smartphone range. 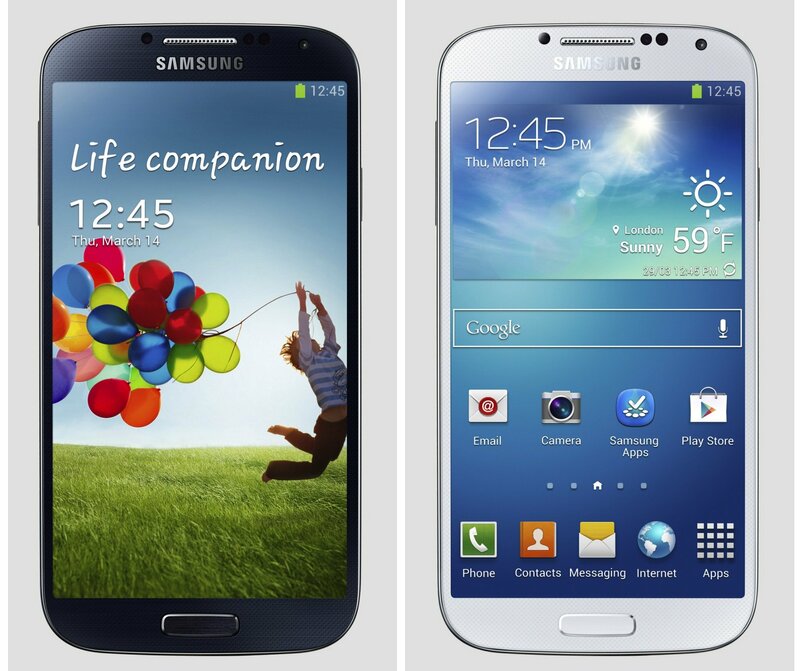 Galaxy S4 follows the S3, a handset that has sold more than 40 million units. The Galaxy handsets are seen as the closest competitor to Apple’s iPhone. Analysts predict software that tracks where users are looking and automatically scrolls down the page as it is read, without it being touched. There is also expected to be a souped-up camera and processor. But crucial to Samsung’s future success, analysts say, is how the South Korean company plans to turn its strong position in the smartphone market into greater success with other devices such as tablets. Prior to Thursday’s launch in New York, Samsung has unleashed a huge advertising campaign, including a series of videos involving a small boy tasked with looking after a “top secret” box. Like the S3, Galaxy S4 is expected to run on Google’s Android operating system – but analysts are predicting some heavy customization from Samsung in order to give the device a more distinctive feel and, crucially, set it apart from its competitors’ Android-based handsets. This is important, says Gartner analyst Roberta Cozza, if Samsung is to gain a higher level of loyalty to its device range. Unlike with Apple, where a large number of iPhone owners gravitate towards the iPad when they decide to purchase a tablet, the same cannot be said of other brands, where customers more likely to mix and match. “We will see more of a step towards more ‘stickiness’ towards the brand,” Roberta Cozza says. The expectation Galaxy S4 will feature eye-tracking capability has been heightened by existing technology in the Galaxy S3 – the phone’s Smart Stay function stops the screen from dimming when somebody is looking at it. Furthermore, the New York Times notes that Samsung filed for a couple of trademarks this year named “Eye Scroll” and “Eye Pause”. Analysts also predict the standard array of upgrades – faster processor, better camera – and Roberta Cozza predicts we will see something of a small leap in a major area of Samsung’s expertise. “I would think they will leverage some strength in display,” she says. Supposed leaked images of the phone show a device that is slightly bigger than Galaxy S3, but largely the same in appearance. Another company relying on Galaxy S4 to follow successfully in the S3’s footsteps is Google. Its Android software is used by more smartphone users than Apple’s iOS – but makes less money from apps and other related products. Of the Android crowd, Samsung is streets ahead in market share, making more than 60% of all Android smartphones sold. Some analysts believe this dominance could lead to Samsung looking at how it can assert far more control over the operating system – perhaps in a way similar to Amazon which, with its Kindle tablets, launched its own curated app store for its users to buy from instead of Google’s default shop. As well as cutting out Google’s share of the app sale – a curated store also allows for applications designed specifically for a certain device, rather than the largely one-size-fits-all situation in the Google Play store. Ovum’s principal device analyst, Tony Cripps, says Samsung needs to take these steps if it is to fend off the threat from other hardware manufacturers such as Chinese firm Huawei. “While Samsung continues to grow its shipments impressively, the company undermines its own position in the broader ecosystem by providing Google a huge mobile platform from which to influence consumers, application developers and advertisers,” he says. “It is very difficult for Samsung to achieve that level of influence itself while it depends on Google to supply device software and key applications and services through Android. With Apple suffering from a dipped share price, and a few recent missteps with product launches, the time is perhaps ripe for Samsung to pile pressure on the iPhone-maker. “It is an important device for them because they have got to a point where they are competing head-to-head with Apple, creating a lot of expectation,” says Roberta Cozza.